HP Deskjet 1110 is a simple and lightweight standalone inkjet printer with the most basic features that make it ideal for personal printing application at home. With a very small footprint printer can be a handy device for students who need printing for school projects. The printer is just 2.06 kg with a footprint of 9.5 x 16.69 x 7.49 inches. The control panel is also very simple and straight making it easy-to-use even for a first-time user. 60-sheet paper input capacity is adequate for home users that need printing occasionally. For printing through PC, it totally depends on USB cabled connection. Quality for both text and image printing is good, meaning that it can be used for a variety of purpose by a family. The HP Deskjet 1110 ink cartridges are available in a pack of two (one black and tricolour cartridge). Printing resolution for colour goes up to 4800 x 1200 dpi while for the black and white it goes up to 1200 x 1200 dpi. The printer is compatible with Windows, Mac and Linux. HP Deskjet 1110 does not feature a scanner and copier but just a good quality printing facility. With standalone printing coupled with cabled connectivity, the device offers the most basic features to users who don’t require multifunction capability. The device is lightweight, cheap and simple and sweet, designed mainly for home users who just need a solution for occasional decent quality printing at a reasonable price. How to fix “black ink cartridge problem” message in HP Deskjet 1110 printer? 1. Remove the black HP Deskjet 1110 ink cartridges from the cartridge carrier. 2. Check for the protective piece of plastic tape in each cartridge. A piece of plastic on the cartridge contact can affect the print quality. Therefore it is recommended to remove it carefully. 3. Reinsert the ink cartridge in the carrier and restart the printer. 4. Even if the error message is displayed. Clean the cartridge contacts. And reinstall the ink cartridges. 5. After working on step 3 and 4, if you still face the cartridges problem, then replace the black HP Deskjet 1110 ink cartridge with the new ones. How to enter and exit single-cartridge mode in HP Deskjet 1110 printer? To enter single cartridge mode in the HP printer, remove the HP Deskjet 1110 ink cartridges from the cartridges carrier. Single-cartridge mode alert message is displayed on the screen during this mode. If two cartridges are installed in the printer and the alert message is displayed, then make sure to check the HP Deskjet 1110 ink cartridge in the cartridge carrier. The protective piece of the plastic tape at cartridge contact must be removed. If the tape is removed then clean the cartridge contact area. To exit single-cartridge mode, install the black and tri-colour ink cartridges in the printer. Make sure that the cartridges are installed properly. If the cartridges aren’t installed properly then single-cartridge mode message will display on the screen. Single cartridge mode is used when the ink cartridge has to be used for future use or mainly when one of the ink cartridges is expended. Q. I will be away on a business tour for a few weeks. Should I remove HP Deskjet 1110 ink cartridges from the printer before leaving? A. Yes, please make sure you remove the ink cartridges from your printer before leaving. Keeping cartridges in the printer for too long when the printer is not in use can result in clogging, i.e. the ink on the printhead of the cartridge will dry up and block the ink inside to pass through for printing. Q. What quality ink do you fill in compatible cartridges? Will I get professional quality printouts if I use compatible HP Deskjet 1110 ink cartridges in my printer in office? A. Please be assured that we fill only premium quality ink in our ink cartridges. We guarantee you’ll get superior quality printouts that will be at par with professional standards when you use our compatible ink cartridges. Besides, you will be saving a big amount of money and have access to dedicated support from us. 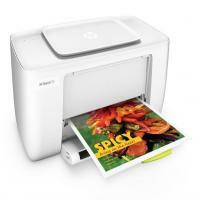 Q. I need a good printer for home which is simple, affordable and perfect for basic printing tasks. I don’t want anything fancy but a nice, lightweight machine for occasional use. Can you please advise HP Deskjet 1110 printer will be a good choice? A. The HP Deskjet 1110 printer will be perfect for you and your family. It is a smart, affordable and lightweight printer which carries out basic printing well and yet delivers high-quality texts and photo printing. The printer compatible with Windows, Linux and Mac and is easy to use for beginners as well. Q. I bought compatible HP Deskjet 1110 ink cartridges from you last week but they aren’t working and so want to return them. Would you please confirm whether you’ll take it back and process my request? A. Yes, we facilitate easy returns as well as replacement if you’d prefer that as well. We will check the printer after we get it and also go through the details we would request you to provide and then see how to proceed.